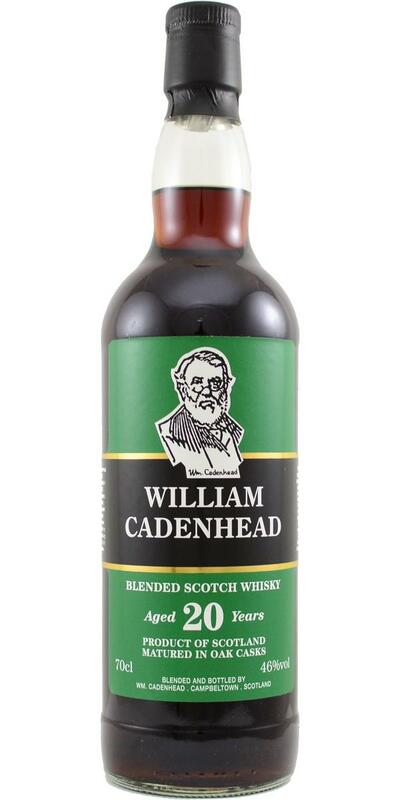 This Cadenhead Blend is from a living cask that is bottled in batches. 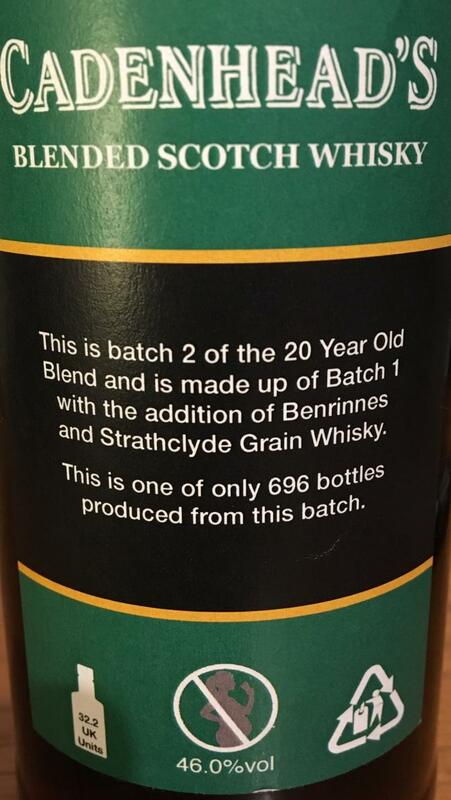 Batch II contains Glenrothes, Benrinnes and Invergordon. All components are at least 20 years old. The liquid in the bottle is one of the darkest I have ever seen. 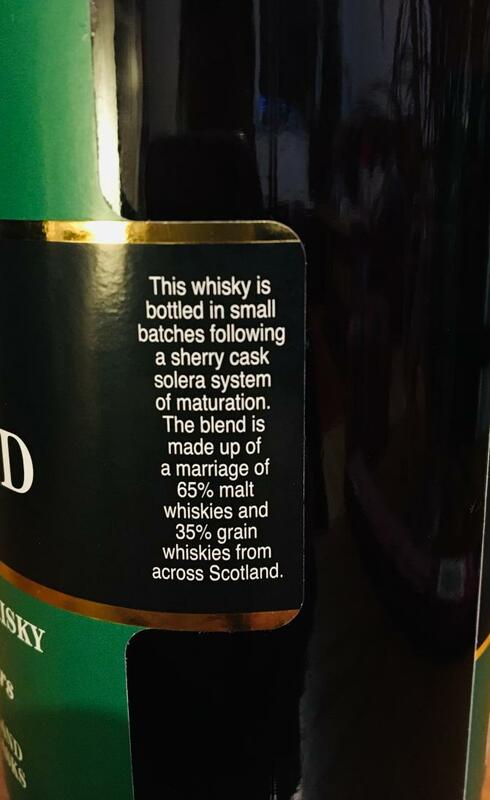 The solera sherry cask must have been very active to say the least. Nose: Overripe raspberries, dark grapes, black cherries, strawberry bubblegum, creamy vanilla, garden herbs like rosmarin and thyme. A fistful of european oak. Polished mahoganytable. Leatherboots. An armagnac–like earthyness. A hint of musty woodsmoke from the Benrinnes appears in the back. Lovely. I would not have guessed a blend here. No grainy notes so far... Damp, old wine cellar, old books, wet earth. Dunnage warehouse. A sherry bodega in spain. Finally, some nice, buttery cereal notes from the aged grain show up. Toasted bread with salted butter and orange marmalade. Taste: Creamy and velvety arrival with lots of aged oloroso, sweet herbal liquors, Fernet Menta...? Nice development on bitter orangepeel, mint candy, brown sugar, maple syrup, rosmarin, fennel, thyme. English breakfast tea. Buttery shortbread and marzipan. A pinch of salt. In the finish the european oak kicks in with a spicy espresso kick. Comments: Already one of my favourites of 2019. This one just oozes aged dark sherry flavours. Tastes and smells much older. The small grain amount makes for a very nice sipping dram. A hint of smoke adds complexity. Also the strength is perfectly chosen. Makes you want to pour the next dram ;) Congrats to the blender, a great recipe. Looking forward to batch III. Crass part. Tasty, spicy but full sherry board, with an incredible toffee sweetness, especially in the mouth and at the beginning. However, nice start with his 46% and delicious to drink. Subtle is just different. The grain is noticeable minimal, but it is well integrated and rather delivers the sweet component in the blend. The scent is impressive, with raisins (Joh! ), Something of ash and meat - raw ham, more precisely - and a pile of dried dried fruits. Sniffing and sniffing is so interesting that I only actually drink after 15 minutes. Well, fifteen, five. The first taste is sharp and somewhat flat, with a strong peppery aftertaste. There is coffee and cocoa in the taste, the whiskey is certainly not (very) sweet. Tobacco and leather, and, after extensive chewing, herbs, ricola alpine sweets and the aromas of that old-fashioned pipe tobacco that used to smell so sweetly sweet in the old days. Also some drop in the aftertaste, which is otherwise short and businesslike. Hmm. What to say. The 89.2 I do not get out. It is undeniably tasty and worth it, the price is great; between the sharp start and the short finish is delicious whiskey, but for more than 86 points the start and finish must convince me. That is right, the first whisky bottled in 2019 that we’re trying on little WF! Every year a great moment, a moment that happens earlier and earlier in the year, having said that. Colour: reddish mahogany. Nose: sherry, walnuts, chestnuts, strawberries, figs, geranium, peonies, rosehip tea, prunes, goji berries. That’s right. Some pencil shavings too. Mouth: there’s more grains in mezcal, I’m telling you. In truth this is the heaviest form of whisky one could think of, chock-full of caraway, sloe, blackberries, cloves, morellos, and the oddest Outer-Mongolian herbal liqueurs ever. 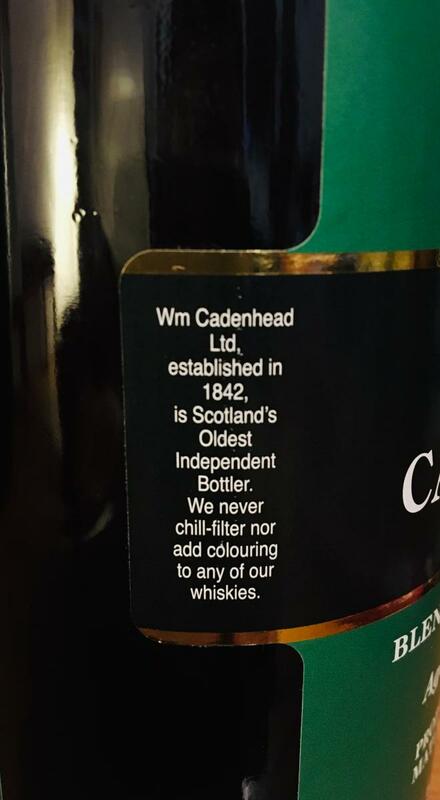 Really totally odd and un-whisky, perhaps a drink for hard-brexiters only? Finish: extremely long, liqueury, pine-y, heavy, thick, invading, tarry… Comments: a statement? A cry for help? A tribute to the Austro-Hungarian empire? Slade? T-Rex? Golden Earring?